Thrift store finds can make some of the best home decor! 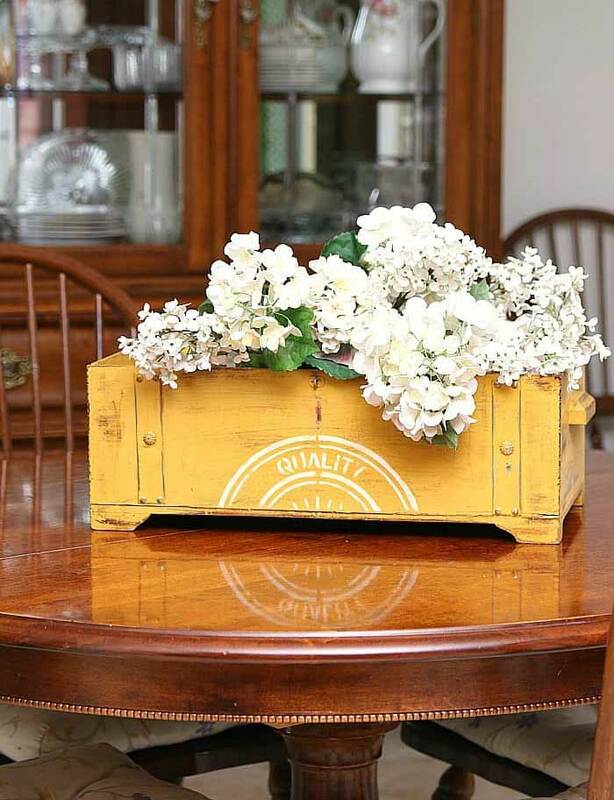 Many times, the items that you find have really good bones but are just in the need of an update. Since the prices are so much cheaper than buying new, you can afford to spend a little on making them over. Overall, you get a custom and current look for just a fraction of a brand new purchase. However, you kind of need to shop these stores frequently to get the best stuff. It tends to go fast! I have gone in too many times spotting a great looking desk or dresser only to see that big old sold sign stuck to it when I got close. You also have to go in with an eye for potential. Maybe a furniture piece isn’t exactly the way you would want it but what could it become? Here are some of the best thrift store finds that have been made over. This chest has a great design to it. However, the original look was a little rough for pretty home decor! Now, with the bright yellow paint to cover the dark stain, it looks so fresh. The added stencil also completes the farm look and it’s now perfect for holding flowers. 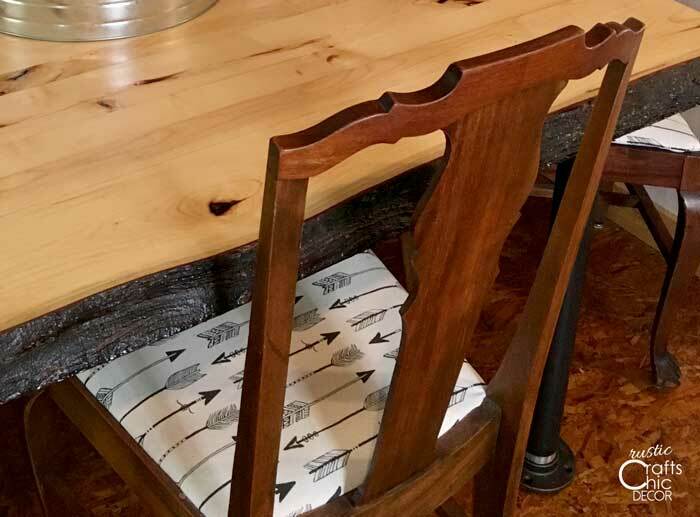 I needed a set of chairs to go with our rustic cabin table, so it made a lot of sense to buy them from a thrift store. The chairs were in pretty good shape accept for the seats. If you can imagine old flowered fabric that is tattered and dirty, that’s what these were. They didn’t look real attractive like that. However, switching out the fabric and padding is super easy to do and I ended up with a custom look that fit in well with our the cabin. It was just a matter of unscrewing the seats from the chair. Then I tore out the old fabric and padding and added new by simply wrapping the wood base and securing it with staples underneath. This cheerful and artsy looking lamp used to be a very ugly pinkish color. 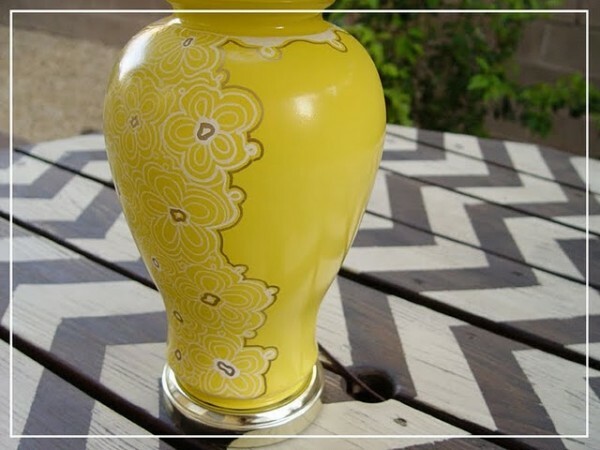 The fun design was achieved using none other than paint markers on top of yellow spray paint! I just love the finished look. 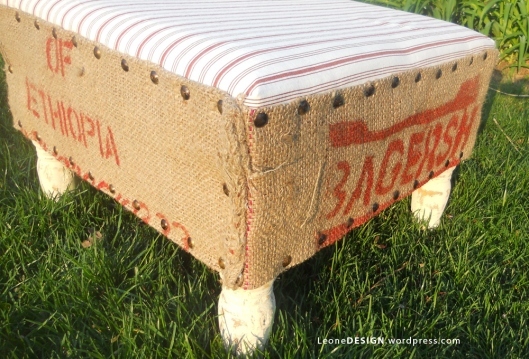 An old worn out dark ottoman gets a fresh new look with burlap coffee sacks and a coordinating striped fabric. Some white paint on the legs also lightens the look for a fun shabby chic style. Side tables are pretty easy to come by at thrift stores. To get a look that is updated and home worthy sometimes you really have to look outside the box. 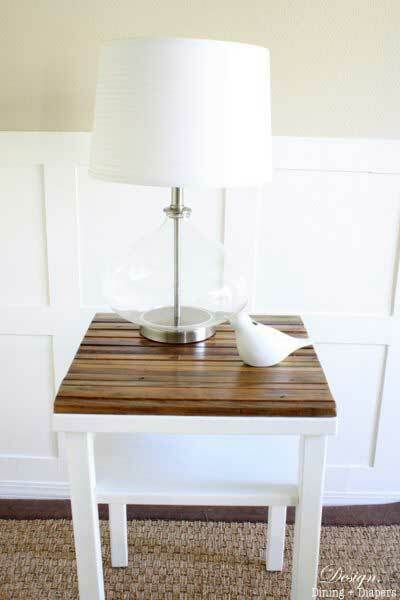 This formally plain table has a ton of wow factor now with the added salvaged wood top. The wood pieces came from an old trellis and gives the perfect rustic chic look. I hope you have been inspired by these great thrift store makeovers! Now start shopping! !